Federation of Young European Greens (FYEG) General Assembly & 30th Anniversary, The Netherlands. 30 years ago, a group of young people from Europe got together and decided to join forces. Now, 30 years later, FYEG is a blossoming Federation, with 42 member organisations. There are many stories about the history of FYEG. Were they hippies, camping (half) naked at a lake once a year? Or were there political aspirations from day one? Throughout this year, together with the Ecosprinter, we will shine a light on our history. We will explore the key moments of our movement. We will look at the common fights we have fought in Europe. And of course look at the ones we won. Because of our 30th birthday we will organise a special General Assembly (9-11 May) and Spring Conference (12 May) this year. We will invite people that have played an important role in our movement and celebrate our common progress together. We will reflect on where we are now. What are the most important political forces we are facing and how much space does a progressive, ecological organisation get in an increasingly conservative 21st century. 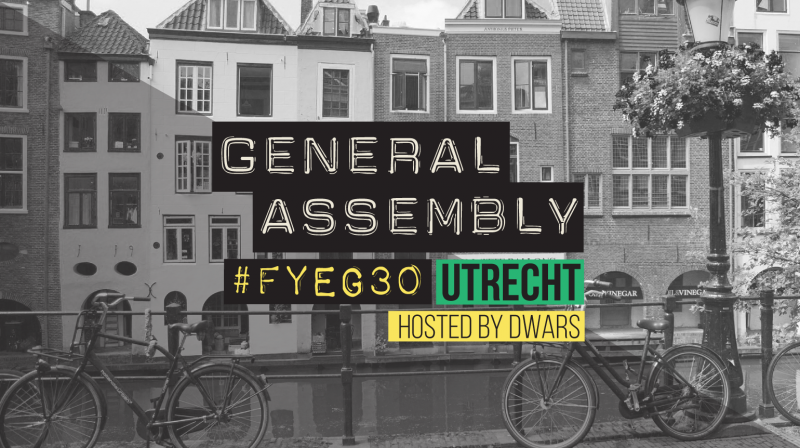 The Federation of Young European Greens warmly invite you to join our General Assembly + Spring Conference in Utrecht, Netherlands, from 9-12 of May. In 2018, FYEG is celebrating its 30th anniversary. Europe is facing tumultuous times where the issues we value as a progressive, pro- European, tolerant organisation are increasingly less self-evident. We are therefore looking forward to celebrate our past achievements and look forward with a new, resonant vision for Europe. We therefore, couldn't be any happier to have chosen Dwars - Dutch Young Greens as our hosts. The GA is the most important decision making event that takes place each year. The political course of the federation and the leadership is confirmed according to a democratic procedure. Every year we combine our GA with a spring conference on different hot topics facing Green Youth in Europe. This year the spring conference will be extra special, as we are celebrating our 30th birthday! Besides encouraging your members to apply for FYEG's statutory bodies feel free to start choosing your delegates, preparing them for GA and booking tickets to Utrecht already. - Here is the registration form for the delegates. Please fill it in as soon as possible. Deadline for registering delegates is 27th of March. Deadline for observers registration is 10th of April. - Please bear in mind that travel costs and participation fee for first delegate is covered by FYEG. Participation fee for second delegate is 200 euros (or 100 euros if there is gender parity in delegation). Travel cost is not covered. Participation fee for observers is 200 euros. If you have a specific situation that prevents your MO or delegate from being able to pay the fee please contact our treasurer. It's a good practice to have one experienced (been to previous GAs) and one inexperienced delegate(to ensure transfer of knowledge). I'ts a good practice to have gender-balanced delegation. It's a good practice to book tickets as soon as possible. - Arrival and departure: The GA and Spring Conference will take place in Utrecht from 9th-12th of May. Registration is open from the 8th of May. That’s the day when we expect the delegates to arrive (anytime). Departure day is 13th of May (anytime). - Registration: Everyone attending the General Assembly must register in an online form here. This is regardless of your position or function, so as soon as you read this email, please take some time to fill it in and send it to everyone you know to attend. Nominate and register your delegates before March 27th Midnight. FYEG will cover the travel costs of your first delegate. Deadline to register as a guest or observer is April 10th. - Organisations applying for membership in FYEG (candidate, full or observer membership) must send the documents listed under §7.2.1 of the Internal Rules of Procedure (including this questionnaire) to [email protected] by 27th March 2018 midnight CET. For any questions, please refer to [email protected]. - Financial conditions: VERY IMPORTANT Please, read this document to get detailed information about travel limits, reimbursement rules and participation fee! If you still have any questions - write us on [email protected] and [email protected] immediately! - Do you need visa? MO’s from countries which need visa (notably Armenia, Belarus, Turkey and Ukraine) are encouraged to nominate and register their candidates as soon as possible. Please contact us at [email protected] and [email protected] as soon as possible so that we can start the procedures right away and ensure that all participants are granted their visa.